Last week I showed you a frame of Futurama with a peculiar symbol. So, where did I already see this symbol? That letter is the aleph, the first letter of the Hebrew alphabet, that seems to come from a hieroglyph of an ox. In the Kabbalah it refers to the origin of the universe, the "primordial one that contains all numbers". Such fascinating object of course caught the attention of the Argentine writer Jorge Luis Borges, an artist that wrote a lot on the concept of infinity. 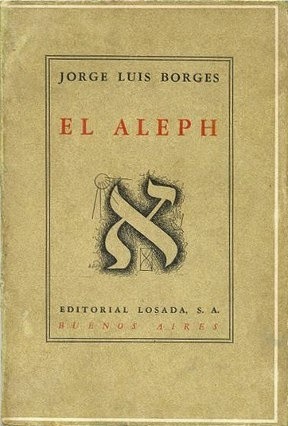 I can make many posts on his work, but for now let's consider his short story "The Aleph". All language is a set of symbols whose use among its speakers assumes a shared past. How, then, can I translate into words the limitless Aleph, which my floundering mind can scarcely encompass? This is all very nice, but Futurama's cinema had a 0 under the aleph, right? What does it mean? 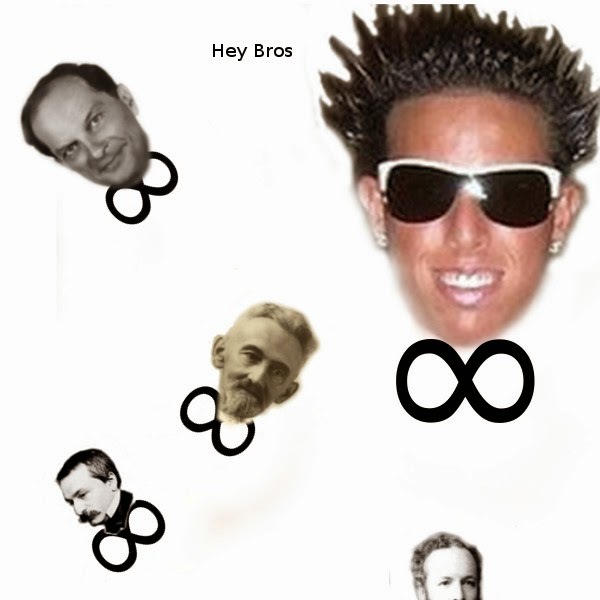 suppose that I go to Cantor and I show him Infinity Leopold, then he will provide me Infinity Felix, an infinity bigger than Infinity Leopold. 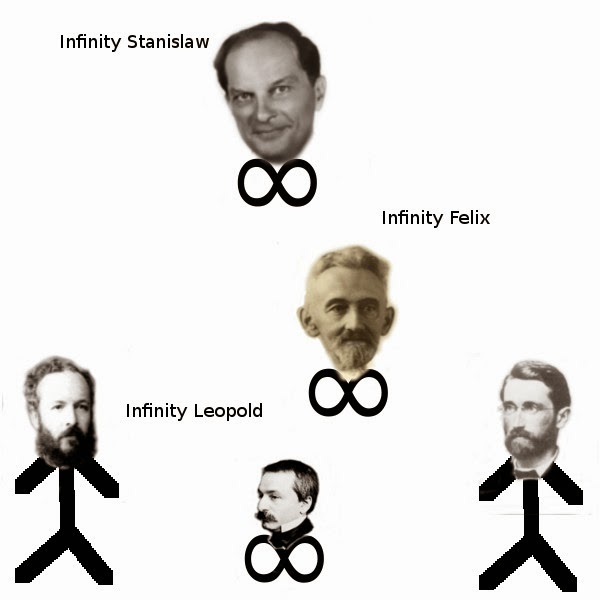 But of course, we can go on, and introduce Infinity Stanislaw, an infinity even bigger, and so on. But now, Infinity Chad comes to disrupt the party with a "Hey, bros". Typical Chad. Where does Chad go? Is it bigger /smaller than the other infinities? Is it something completely different and not comparable (like apples and oranges)? 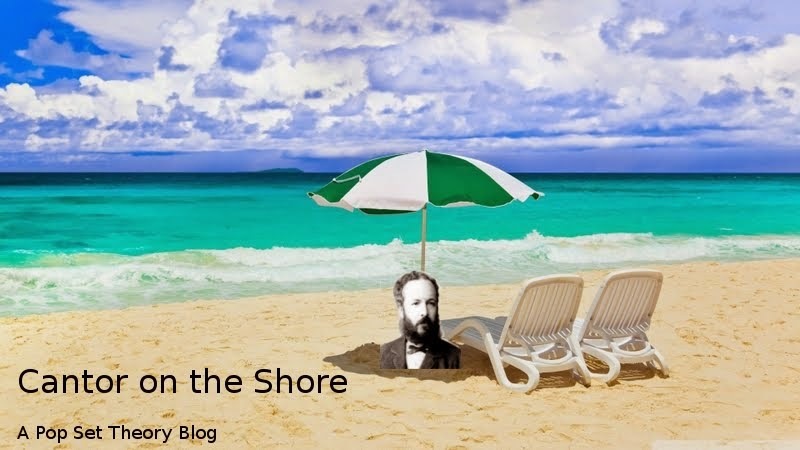 Under normal circumstances (*) it turns out that yes, the infinities are linearly ordered, i.e., any infinity is either bigger or smaller than all the others, and Chad (alas) has its place. As there is a limit of the names I can come up with, and nobody wants an Infinity Iqalussuarniartuqqasaagaluakagunnuuq, we can just call them First Infinity, Second Infinity, and so on. Better! thinks Cantor, let's use a symbol just for that. But which symbol can express the limitlessness of infinity, something that "contains all numbers", something that can translate into words things that a mind can scarcely encompass? And so the infinities were called aleph 0, aleph 1, and so on. The smallest one is aleph 0, and it is the infinity of the natural number, the smallest infinity ever. Therefore the aleph 0-plex in Futurama is telling us that in that cinema, for any number, there is a screen. This opens up lots of questions on the physics of that universe, but let's not go there. For the Kabbala, the letter stands for the En Soph, the pure and boundless godhead; it is also said that it takes the shape of a man pointing to both heaven and earth, in order to show that the lower world is the map and mirror of the higher; for Cantor's Mengenlehre, it is the symbol of transfinite numbers, of which any part is as great as the whole. Ehm. I don't know how to say this. Who am I to correct the great Borges? Well, but this is the aim of the blog, right? I... I will write it in a smaller text. No! It's not! It is not true that in the transfinite numbers (aka what I called infinities, and now it's called infinite cardinals) ANY part is as great as the whole. Pick a transfinite number, and pick a finite part of it. See? You have a part that is not "as great as the whole". It is true that the infinite is characterized from having parts of it that are as great as the whole (remember 0 to 1 and 0 to 2? ), but not ANY of them. You screwed up BIG TIME, Borges. Phew, I am sorry Borges. But the first quote is so true. Just thinking about infinity, one can feel a sensation that it's not possible to explain in words, something so dizzying that the mind just boggles. I will try next time to show you some games that can give you that sensation, with the help of an advertisement and... a kindergarten. (*) People think that Mathematics is made of statements that have an universal value, and therefore extremely objective. It is true that mathematical statements have an universal value, but sometimes people don't agree on what the Universe is. There are thus many groups of people inside mathematics, with opinions that differ. For example, in this post I postulate the existence of infinite sets, therefore going against finitists (like Kronecker) and ultrafinitists. In the next post I define a way to compare infinities that not all people agree with. Well, just one or two don't agree with it, but their results are solid, so it is right to acknowledge them. Finally, for the result above I use the Axiom of Choice, that basically says that if you have infinite pairs of socks, you can pick one for any pair (Russel quote). Here I am going against intuitionists and constructivists. Of course the big majority of mathematicians agrees with me, but at each his own. Every problem solved brings with it dozens of new problems to solve. Linearly ordered infinities bring the Continuum Problem, for example. Also, I would say, the aleph would make a cool tattoo. you write "Let's go back to Cantor, our hero. He proved that there are infinities bigger than other infinities" with a link to your previous post. But in your previous post you just showed how [0;1] and [0;2] are the same type of infinity. One can easly extend this reasoning to all the infinite sets of real numbers, thus is there only one type of infinity? I guess not.